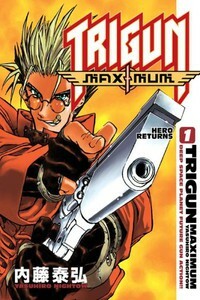 As an anime series, Trigun gained a multitude of fans across the otaku landscape before gaining a huge mainstream manga audience. Now, Trigun goes beyond the storyline laid out in the anime and the first two volumes of the manga into brand new territory! Our hero Vash the Stampede disappeared for two years after blasting a crater onto the moon orbiting the desert planet he saved from annihilation. But, with good and bad people alike trying to track him down he won't stay lost for long! Count on more crazy gunslinger action, new dastardly villains…and a new outfit to boot!